Ickworth House is a country house near Bury St. Edmunds, Suffolk. It is a neoclassical building set in parkland. The house, built between 1795 and 1829, was formerly the chief dwelling of an estate owned by the Hervey family, later Marquesses of Bristol, since 1467. 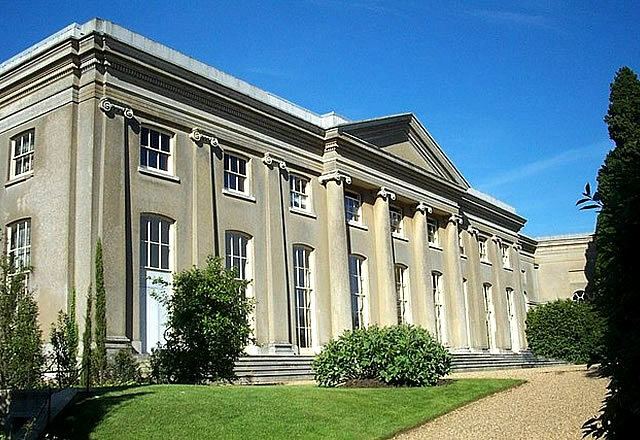 The building was the creation of Frederick Hervey, 4th Earl of Bristol and Bishop of Derry who commissioned the Italian architect Asprucci to design him a classical villa in the Suffolk countryside. The Earl died in 1803, leaving the completion of house to his successor. In 1956, the house, park, and a large endowment were given to the National Trust in lieu of death duties. As part of the handover agreement, a 99-year lease on the 60-room East Wing was given to the Marquess of Bristol. However, in 1998 the 7th Marquess of Bristol sold the remaining lease on the East Wing to the National Trust. He was succeeded by his half-brother Frederick William Augustus Hervey, 8th Marquess of Bristol (born 19 October 1979). The National Trust refused to sell the remaining lease term back to the 8th Marquess, thereby contravening the Letter of Wishes which states that the head of the family should always be offered whatever accommodation he chooses at Ickworth. As one of England's more unusual houses, Ickworth has been unflatteringly described as resembling "a huge bulk, newly arrived from another planet" and as "an overgrown folly" Yet, is now being architecturally re-asessed and recognised as the only building in England comparable with the monumental works of Boullée and Ledoux. The design concept was based on the designs of Italian architect Mario Asprucci, most noted for his work at the Villa Borghese, which the Bishop-Earl had seen. Asprucci's plans were adapted and the building work overseen by English architects Francis Sandys and his brother Joseph Sandys. The façades are of brick covered in stucco; beneath a roof of slate and lead. The central rotunda is 105 feet high with a domed and balustraded roof. the building is entered through the central entrance ionic pedimented portico. The rotunda is decorated with pilasters, which on the lower floor are Ionic and Corinthian above. The ground and first floor and the third floor and the balustraded parapet are divided friezes bas-relief. 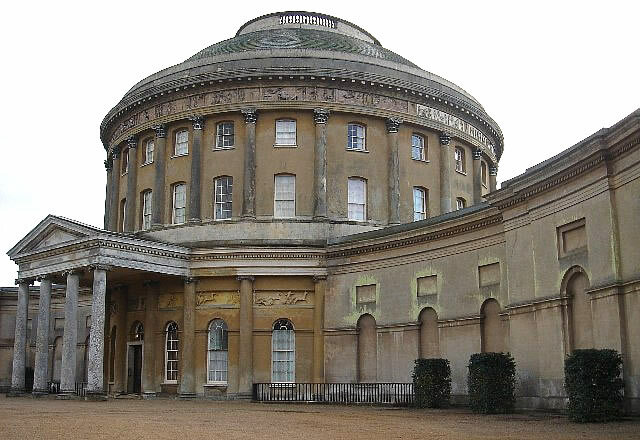 The rotunda is flanked by segmental single story narrow wings (appearing as a blind arcade) linking, in the palladian fashion, to two terminating pavilions; these segmental wings are broken at their centre by projecting bays which house the Smoking Room and the Pompeian Room, both later 19th century additions. Unlike the design of a true Palladian building, the terminating pavilions, rather than minor balancing appendages, are in fact large wings, complementary in weight to the rotunda which becomes their corps de logis. The East Wing, a small mansion in itself, was designed to be the everyday living quarters of the family (which it remained until 1998), thus permitting the more formal rooms of the rotunda to be reserved for entertaining and display. The west wing, intended as an orangery, sculpture gallery and service rooms remained an unfinished shell until the beginning of the 21st century. For much of the time it was used as agricultural storage. On display are paintings by Velázquez, Titian, Poussin, and Claude Lorrain, as well as an unrivalled series of 18th-century family portraits by artists such as Gainsborough, Reynolds, Vigee-Lebrun, Batoni, Angelica Kauffman, Ramsay, Van Loo, and Hogarth. In addition, Ickworth has arguably the best collections in Britain of fine Georgian silver. The house also contains very good examples of Regency furniture and porcelain. West Wing is fully accessible to visitors. Lift to all levels in the Rotunda - restricted access for mobility vehicles and wheelchairs due to the building's structure. Designated mobility parking in main car park for Blue Badge holders; a golf buggy service to and from the car park in the main season. Outdoor wheelchair available from the West Wing reception. Drop-off point for passengers with disabilities at the rear of the West Wing. Partly accessible grounds (map available), loose gravel paths, some steep slopes, terraces and steps; five single-seater Personal Mobility Vehicles (PMVs) available. Assistance dogs are welcome. There are disabled toilets in both the West Wing (left hand transfer) and the House (right hand transfer). Transport: Bury St Edmunds (National Rail) then bus. Bus Routes : 15C, 374, Breeze2 and M88 stop at Horringer 0.75 miles.